I’m messing about with Zigbee for a comms protocol to various temperature sensors, and this requires a Zigbee Coordinator. There’s a few ways of doing this, but ultimately I settled on a zigbee2mqtt bridge and a cheapie AliExpress CC2530+CC2591 module. 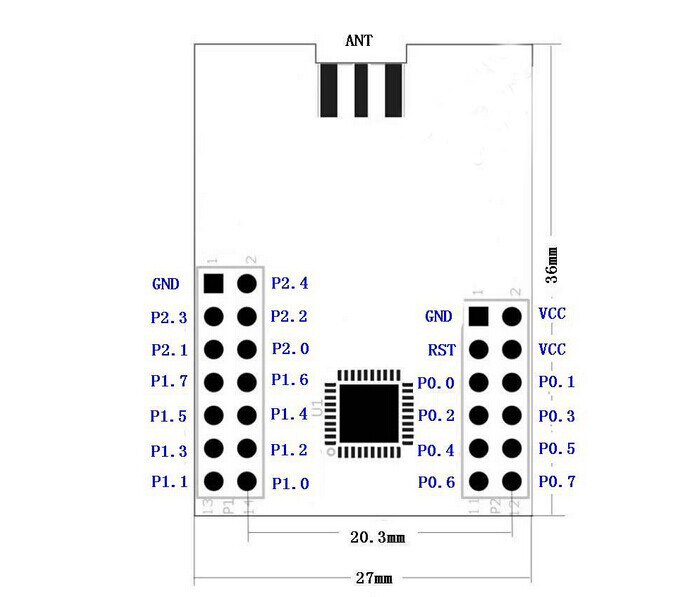 This module incorporates an RF amplifier, but does not have the normal debug header that the CC2530 Zigbee transceivers have and also lacks the USB-TTL adapter chip. Not a problem if you’re using a RPi as the bridge, which is what I plan on doing. However first, you need to get Z-Stack firmware on it, so you can use it as a coordinator. This proves to be… non-trivial. Especially if you want to use a Wemos D1 Mini as the flashing device (these Wemos things are really good, incidentally). From there, you should now be able to go to the Boards Manager, and install the esp8266 package. Once that is installed, configure your board as a “LOLIN(WEMOS) D1 R2 & Mini” and select the correct COM port. These mappings are required. Upload to your device. You now have CClib-Proxy onto the Wemos and ready to go. When using a Wemos as the flashing device, it’s safe to tie the two I/O pins together (D5 and D6) and connect them to the DD pin on the CC2530. It works fine. The P0_2 and P0_3 pins are used when you’re using the finished device, not when flashing (so you don’t need to connect them up). The above diagram shows the pin mappings on the CC2530+CC2591 module itself. Follow those numbers and the pins above to wire it up. This diagram shows the pinout of the debug header (which is not present on the CC2591). 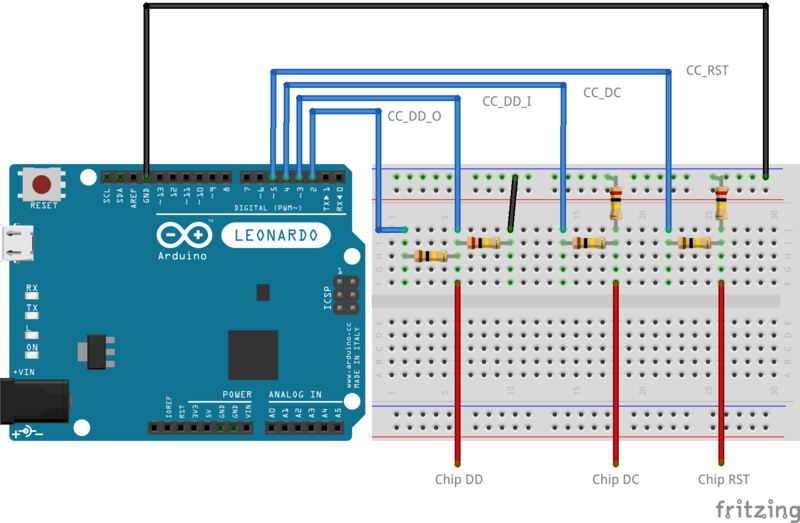 However, it does show which pins on the CC2591 marry up to what purposes on the debug header (which correspond to pins on the Wemos). After this is done, you need to use CClib to flash the firmware. This will take an extremely long time. Several hours. But you should see progress fairly quickly. Just hang tight. Once that’s done, you have a coordinator! Next post will deal with testing the coordinator out. After having my AnyCubic for a week, I’ve done a fair bit of tuning and mucking about. I’ve printed several benchmarking prints and calibrated the steppers. It’s printing fairly well now. Here’s what I did. The very first step is to get the first layer adjusted. Fortunately with Marlin, this is quite easy and you can use mesh bed levelling. Get the bed fairly flat initially using the normal levelling technique that the AnyCubic includes, then follow this guide. Use a thin piece of paper (thermoprint receipt paper is perfect), and do it while the bed and nozzle is hot. The next part is to calibrate the extruder stepper. I measured out 130mm of filament, and told it to extrude 100mm. A longer length gives better accuracy. Read the calibration guide for instructions. After doing that, measure the thickness of your filament in a few points and adjust the filament thickness in Cura to suit. In my case, my filament is a LOT thicker than 1.75mm (it’s actually 1.98mm), which makes a difference to extrusion and can throw off the next test. Now you have your extruder calibrated, you can print a calibration cube. After that’s printed, you can measure its dimensions and then adjust your XYZ steppers. At this point, all your axes should be calibrated, your bed is level, and you know how thick your filament is – so the majority of the dimensional calibrations are done. You next need to print a temperature tower. However, this will require some manipulation in Cura to make it work. Consult the readme, and in there you will find a list of the layer Z heights that should correspond to what temperatures. From there, you can use Cura extensions to fix it. Set your print temperature to 180 (which corresponds to the “floor” temperature setting in the readme), then click Extensions->Post-Processing -> Modify G-Code. Click Add a Script, then ChangeAtZ. Specify the height as per the README, then check the “Change Extruder 1 Temp” box, and enter the temperature for that height from the readme. Click Add a script again, and repeat. You’ll need to do this a bunch. Sorry. Print it off, and then examine it. Select the temperature that looks best (for me that was 190 degrees), and that will be your new default print temperature. Some words about why these settings were picked is relevant – some of them I haven’t actually tweaked, but I know they are relevant. Quality: Layer Height is picked according to the resolution you want. The initial layer is selected to be 0.3mm to aid plate adhesion. Shell: Thicknesses can be reduced if you want a faster print at the expense of speed. 0.8mm is a common choice. Ironing will get the nozzle to wipe over the top layer to smooth it off. Infill: Change density as desired for part strength. Material: 190/60 fits my filament well. The initial layer temperature promotes good adhesion of the first layer to the bed, hence the elevated temperature. Retraction distance and speed were tweaked to reduce stringing effects. Speed: Print speeds can be adjusted downwards, but I wouldn’t adjust them upwards. These fit the recommended speeds of the AnyCubic. The outer walls and top/bottom are slower to promote better surfaces. I haven’t tweaked the acceleration and jerk much, but they are enabled so I can mess with them later. Travel: Changing Combing Mode will reduce the effect where strings are placed just under the skin layers, leading to ugly looking tops/bottoms. There is a small cost in print speed, but in my opinion it’s worth it. Cooling: The fan at 100% is rather excessive, hence ratcheting it down. The initial fan speed and layer settings promote better bed adhesion by reducing cooling for the first few layers, which then ramps up as the print proceeds. Support: I set Touching Buildplate so I don’t get internal supports, which are horrible to remove. This needs to be tweaked as per your needs. Build Plate Adhesion: Brim adhesion prints a single-layer brim around your piece. It greatly improves adhesion and reduces warping, and is pretty easy to remove from a finished piece with your fingernails. Worth having as a default. Ok. After all the above is done, you should have your temperatures dialed in, Cura set up with some useful parameters, and your axes all calibrated. Your bed should be flat. Next up is to tweak the G-Code used to start the build. I’ve selected to perform a nozzle wipe procedure after initial setup. This procedure prints a short line of filament at the front of the bed before wiping the nozzle away to clear it. This is pretty similar to the default Cura settings for the AnyCubic. A few things warrant talking about though. The M501 / M420 steps enable the Mesh Levelling you set up in Marlin. This should be done just after reaching the home position. The steps after mesh leveling and before the final platform position change (setting the head 15mm above the platform) perform the wipe. That is the Cura defaults. The above settings should produce decent results. Ok, that was a lot. Now that’s done, I’m printing various other bits and pieces for the printer – more will come as I get it done. Oh, and if you’ve set up the printer and want to give it a stress test, print a 3dBenchy with no supports enabled. See how it goes! So I’ve been doing more mucking about with my printer, and I elected to install a custom firmware onto the unit. This firmware is a port of the Marlin 1.1.9 firmware to be compatible with the AnyCubic i3 Mega v3. Oh, it turns out there are four versions of the AnyCubic i3 Mega kicking around. You can find a breakdown of them here. Mine is a v3 – identifiable because it has the Ultrabase, v1.1 firmware, and the SD card board is separate from the mainboard (visible through the slots in the bottom plate). The difference is very important when it comes to firmware updating. The custom firmware has a number of benefits – most notably for me is mesh bed levelling. My bed is pretty flat, but there is a slight concavity in the center (of the order of less than 0.1mm, but it affects adhesion in the very center). So before I went too crazy with calibrating the printer, I wanted to have a better firmware onboard. First of all, firmware updating requires a terminal. Since I have many Raspberry Pis kicking around, the easiest way to get what I want is to install OctoPrint. This comes in a distribution called OctoPi, and has a lot of awesome features including, critically, a firmware updater plugin. After applying the firmware update and restarting the printer, the About on the TFT does not show any change. This is expected. You can, however, see the firmware version information in OctoPi on the Terminal display when the printer starts up. Once that is done, you can then proceed with mesh bed levelling and so-on. I also picked up a Microsoft LifeCam H5D-00016, which can be assembled into a housing for OctoPi with camera here. I’ll be putting that together as a project pretty soon. So I bought myself a 3d printer. I decided on getting an AnyCubic i3 Mega printer, which was pretty cheap considering. Reviews were fairly decent. The printer came with all the tools required to assemble it, as well as various quality of life tools such as a scraper, tweezers, cutters, SD card and USB-to-SD adapter, USB cables, and even some spare parts such as a spare hot end and a spare limiter microswitch. The test print worked out fine. A small amount of stringing, but it ‘just worked’, no calibration was done here. I also noticed a few defects which can be fixed. First up, the fans in this unit are REALLY LOUD. The reason for this is that the fans (on the PSU and on the control board) are much too close to the bottom plate, and the bottom plate obstructs the control board fan. The fix for this is to print a new PSU cover, and replace the control board cooler with a ducted fan. I’ll print these shortly. I did print an extruder knob, but I had to reprint it at 103% scale to get it to fit the NEMA17 stepper. This is likely because the printer is just at factory calibration right now. Next up for me is some calibration stuff, rotating the bottom plate to clear the obstruction on the cooling fan, and getting the fans / printing replacement covers and cooling ducts to make it work better. I’ve recently changed my ISP to AussieBroadband. Since I’m now working under a quota, I want a way to monitor my quota in CheckMK. Enter a bit of python. If you want to use this, you’ll need to adjust the hashbang to suit your actual OMD site, and then pass a parameter which is your username:password to get onto your ABB account. print "UNKNOWN - Unable to parse usage page!" Enjoy. It’s pretty quick and dirty, but it works. You put this into your site’s local/lib/nagios/plugins directory, then add it as a classical check. I’ve recently changed my core router over from OpenWRT to pfSense. I was pretty happy with OpenWRT, but I wanted something more powerful since it was running in a VM anyway. A few days ago, CloudFlare announced their new 1.1.1.1 service. This is a public DNS service very much like Google’s 8.8.8.8 DNS service, with a notable difference. It supports TLS. Why should you care? Because DNS requests are normally not encrypted, and therefore visible to your ISP to record, use for research / marketing purposes, or even (in the case of some nefarious actors) manipulate or change. Running DNS over TLS prevents that, by encrypting your DNS traffic so that it can’t be manipulated or collected. In this post, we’ll be configuring pfSense to do three things – provide a local standard unencrypted port 53 DNS resolver which uses CloudFlare’s 1.1.1.1 encrypted service on the WAN end, and then set up a NAT redirect so any attempts on the internal network to use port 53 DNS servers outside the network instead are intercepted and resolved by the internal resolver. Lastly, it will also make sure that it blocks any outbound requests to port 53 just to be sure. NOTE: There’s one piece here I haven’t figured out yet. How to pin a cert for the DNS endpoints listed here, so it’s not perfect. When I figure that out, I’ll edit this post. You should see a resolve against your router’s local DNS resolver that works. If you really want, use Diagnostics -> Packet Capture, and capture port 853 to verify that requests are being triggered. Follow the article you can find here. You will need to do this once for each of your interfaces (in my case, LAN, DMZ, and VPN). Obviously don’t configure this for the WAN interface. This then causes any requests to addresses that are not on your internal network to be resolved through the local pfSense resolver (which goes out to port 853 anyway). Assuming that’s all fine, you should now be able to configure a broad block rule to bar all outbound port 53. This shouldn’t really be required if the NAT rule is working, but we’ll do it anyway to be sure we’re stopping any DNS leaks. After doing this, verify that you can still resolve against the local resolver (your router’s IP), and that you can still resolve against what seems to be external resolvers (eg, 8.8.8.8). You should also check that when you do so that nothing passes on the WAN interface on port 53. If that all passes, you’re done. It’s up to you if you use the ‘Block’ target or the ‘Reject’ target. Block causes a simple timeout if something hits 53 (which shouldn’t happen anyway), Reject causes an immediate fail. Information about this can be found here. This was done quite a long time ago, apparently, but for whatever reason scripts that ultimately wind up calling the PHP 7.1 interpreter while under Dash break badly under some circumstances (resulting in PHP segfaulting). I have an Olympus TG5 camera, which has RAW support for Darktable, but only in the very latest (currently unreleased!) 2.3.0 version. Since I have Windows, I’ll have to build Darktable directly from source to be able to manipulate it. Here’s how you can do that. Make a shared folder in that folder, and vagrant up followed by vagrant ssh. And off you go. You can add some more mounts into the VM as required to share your picture library or whatever with it so you can manipulate it with Darktable.